Four members of the NGC carpooled together to Cantebury Court a lovely retirement home with a beautiful garden that is a Certified Wildlife Sanctuary. There were over 15 people in attendance for the 4x/year Fulton Federation meeting representing garden clubs from across Metro-Atlanta. The wonderful reception was sponsored by the Atlanta Begonia Society and even included a lively raffle of three gorgeous Begonia plants. Seeing the uproar, Johnnie the president of the Begonia society took names of all of us who wanted plants and she has promised to bring each of us one at the next Fulton Federation meeting! The meeting was opened, and our President Leann and Historian Shante read the inspiration/devotion: “As you wake up today, remember you are created to succeed, design to win, equipped to overcome, anointed to prosper and blessed to become a blessing to others. The program was “Flavors of the Fall” lead by Chef Amanda Dew Manning, Master Gardener and Garden Chef at the Atlanta Botanical Garden. You can also catch her classes at the Salud Cooking School in the Johns Creek Whole Foods. Here’s a tip, the classes at Salud are made possible with volunteers and in exchange for volunteering you can earn points to take cooking classes. I was a volunteer several years ago and still have points for a few classes. I might use them to catch a class with Chef Amanda. Chef Amanda was delightful, full of humor and cherished stories of Julia Child. She talked of her food memories and her first experiences “cooking” mud pies on bricks in the hot Carolina sun and making Begonia soup on her grannies’ porch. I loved how she talked about the benefits of family dinners and letting children explore the kitchen. Miriam Weinstein, author of “The Surprising Power of Family Meals“. The dinner table can be the perfect environment where kids learn how to conduct conversations, observe good manners, serve others, listen, solve conflicts and compromise. This makes me never want to skip a meal opportunity with my kids again! 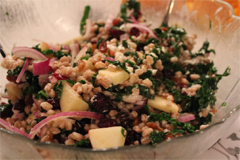 On the menu was, “Apple-Cranberry Farro Salad with Sautéed Greens & Sweet Orange Vinaigrette. Chef Amanda is an avid gardener in fact, she was in the master class program with NGC president Leann Penman. Chef Amanda is an advocate of eating both locally and seasonally. The recipe she demonstrated illustrates both those points. Throughout the demo she gave insightful tips such as buying fresh local pecans and freezing them. Other tips include toasting your nuts and spices to enhance their natural flavors. One thing I learned is to use two types of apples in your dishes, one tart and one sweet for added contrast. 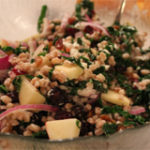 One unexpected ingredient she used was pomegranate molasses which is an Arabic product and can be found at most farmers market. I promptly purchased a bottle and can’t wait to start experimenting with it. As Chef Amanda suggests I plan to try it on fish, in various marinades and dressings. It was a great time and I learned invaluable cooking tips and was reminded to cherish our family dinners.